As the proud possessor of too many complete sets of Beethoven symphonies, I had not intended to acquire any more but in typical collector fashion could not resist this bargain box set when it appeared once I had seen the name of Franz Konwitschny, the genial and bibulous East German conductor whose eccentricities endeared him to his orchestras and public alike. Rob Barnett discussed the symphonies as part of his review of the 2001 release The Art of Franz Konwitschny. This is unashamedly "traditional" in cast - how could it be otherwise, having been recorded (in excellent analogue sound) between 1959 and 1961? But speeds are brisk, vibrato in the strings minimal and execution mostly driven to the point of breathlessness without any of the heartless haste which characterises sets such as the Mackerras' "original metronome speed" recordings - which so exasperated me as soon to warrant finding its way into the give-away pile. Furthermore, Konwitschny observes all the repeats eschewed by more fastidious or pusillanimous exponents - and at the speeds he adopts they do not weary. Time and again I was struck by the sheer elan of these recordings; they exude a delight in music-making, no doubt the product of Konwitschny's Kna-like disdain for over-rehearsal. Nonetheless, you can hear how the Leipzig orchestra responds to his direction: their unanimity crisp, rhythmic precision, accuracy of intonation and fierceness of attack are tempered by a warm humanity, Every symphony receives what seems to my ears to be an ideal interpretation; my only gripe is the omission of my favourite overture, the "Egmont", its absence all the more regrettable given the success of the recordings of the others. 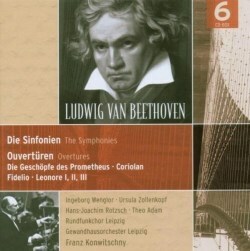 It is particularly interesting and instructive to play the four "Leonore/Fidelio" overtures in their correct chronological sequence (Nos, 2, 3, 1 then "Fidelio"), observing how from 1805 through to 1814 Beethoven progressively streamlined and simplified them, so that they should not overshadow the intimacy of the opera's opening scenes. Thus the Leonore No. 3 makes a splendid showpiece, justifying its traditional inclusion in performance as an entr'acte but emerging as too overpowering as an overture per se; the tautness and concision of Beethoven's final thoughts are far more apt. The First Symphony always sounds to me like mature, fully-fledged Beethoven rather than the supposedly classical, post-Mozartean homage it is sometimes made out to be, especially when it played with such spring and lift. The opening Adagio of the Second is given a stern, weighty account similar in style to Toscanini's approach; the succeeding Allegro is grimly heroic, the timpani very prominent despite the absence of period style hard sticks. The Scherzo is alert and humorous, light as thistledown and as with all the finales here, the conclusion breathlessly thrilling. The "Eroica" is firm of purpose, the first movement rising to a rousing climax; the slow movement is grand and intense, very steady in its inexorable tread, contrasting starkly with the sharp, staccato Scherzo. The Fourth is rather brisker than in contemporary recordings by such as Cluytens, fiercely energised and again, its moto perpetuo finale thrillingly articulated at breakneck speed. The Fifth opens in massive, urgent and direct style - startlingly aggressive; in fact, the way I like it - but the Andante is contrastingly relaxed and urbane before a puckish pizzicato Scherzo and yet another searing finale. I won't dwell on the Eighth other than to observe that it is infused with demonic energy, but move on to the Choral before I grow yet more tedious re-iterating the stellar attributes which uniformly permeate this whole set. The Ninth is given a typically confident, assured and relaxed performance; everything is as it should be: mysterious, noble and numinous. Perhaps the finale starts a little tamely but I think that is simply Konwitschny keeping his powder dry for the detonation which follows. Theo Adam is in best, magisterial (pre-wobble) voice, dominating the quartet but more in the sense of setting the tone than being over-bearing. The soprano and mezzo are excellent and if the tenor is rather too decorous and pretty-voiced he is nonetheless in tune, accurate and able to be heard in the quartet. The nearest comparison I can make to this set is with the Cluytens' equally recommendable cycle with the BPO, recorded around the same time. I own and highly esteem both; I would not want to choose between them as they both epitomise the kind of approach I want to these symphonies: natural, unforced, released and redolent of the untamed creative energy which evidently imbued the being of the composer.